Locavore. Locatarian. Localvore. These are the PC labels for 2010. Whichever you prefer, each comes back to the same definition: eating locally grown, sustainable foodstuffs. Locally, as in within 100 miles of where you are. Everyone is jumping on the locatarian path. Friends, family, neighbors, restaurants, grocery stores. You should be, too. And while you can probably pose many reasons why you can’t, I can offer just as many as to how you can. As for why you should, that’s easy: think lower carbon footprint, freshness which means better quality and taste, global warming, sustainability. You get the picture. The green grocer. First and simplest, watch what you buy. And where you buy. Local farmers’ markets are popping up everywhere. Input ‘farmers’ markets in Houston’ to your search engine, and you’ll more than likely find a market near your home. Shop carefully at your grocery, too. I’m not certain whether it’s mandatory, but most groceries where I shop label products with the country of origin. When I was a child, my family always had a garden. As most children are, I was wary of vegetables. However, after the planting and the care and watching them grow, I learned to love them. We would grow tomatoes, broccoli, spinach, even celery. An afterschool activity every afternoon was to venture out to the garden and check the progress. Start small. A raised bed that’s about four-feet square is ample. Small and well tended is better than large and filled with weeds. Look for the sunshine. You will need a plot that gets about six to eight hours of sunlight. Leafy vegetables will grow in partial shade, but fruit and most vegetables need direct sunlight. Check the soil and the drainage. Houston area soil is not the best, so consider constructing a planting box. Fill it with the best garden soil you can find – the results will be worth the expense. There are certainly others in town and more popping up every day, but the best source I know of for organic soil and compost is Natures’ Way Resources in Conroe. Remember too, that compost additions each season are critical to the success. Buy the best seeds or seedlings. Your tendency will be to buy too many. Stop yourself and concentrate on varieties that have proven successful locally. Send me a quick e-mail if you want a list of recommended places to buy seedlings and such in the area. Care for your garden regularly. They say the best protection for a garden is your own shadow, which is a veiled way of saying that you have to regularly watch over your plot for problems, such as pests, weeds or disease. Remember the season. One of the beauties of being a locatarian and growing your own – or buying local –produce, is that you enjoy the freshest bounty of the season. Now’s the time to plant leaf lettuce, kale, chard, greens, onions, spinach, and arugula. Start your tomatoes by early March. For more guidance, the best resource for our local conditions is Urban Harvest. In early spring, plant squash, beans and peppers. For the summer, plant okra, corn, basil, oregano, sage, mint and a second crop of tomatoes. 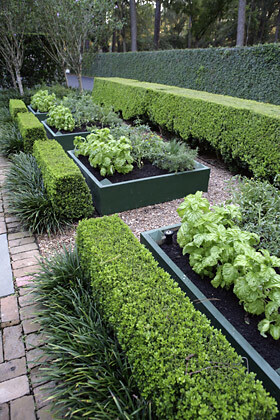 In the fall, more leaf lettuce and cool season herbs such as parsley and cilantro. For vegetables, try spinach, arugula, broccoli, kale, chard or Brussel sprouts. You can do it. We can help. The idea of a backyard garden is an old one, but it’s one that is putting down new roots for good reason. We have clients who are asking for gardens in their new plans or having us rework old landscapes to add one. Several clients are ahead of the curve and their gardens can be seen here. The gardens have resulted in, not only better tasting foodstuffs, but a renewed interest in the earth and a sense of pride at affecting a change for a better, healthier tomorrow. I hope your garden is recovering from the cold winter temperatures. Let me know if you need help or have questions. [I, for one, loved the snow. Take a look at my snow photos here. I would enjoy seeing yours, if you have time to send them.] As I have stopped by our clients’ gardens this past few days, I have been fascinated to see the difference in the damage neighborhood by neighborhood. Some gardens were hit hard, while others suffered minimally. Not surprisingly, the gardens that coped the best are those that did not have exotic tropical plants. 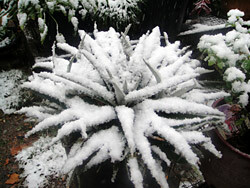 However, I am pleased to report that many of the subtropical species that we have been using fared remarkably well. After our freeze alert e-mail, we had many calls to help clients with protection and I am delighted that we were able to help everyone who called. Our clients were likewise pleased to have professionals take care of the chores and prepare their gardens. We were able to start early in the week, well ahead of the Arctic blast. Lawn: We are aerating and composting now to assure lawns will be lush and green come spring. Trees and shrubs: Crews are taking care to provide deep root feedings for trees and shrubs. Plants: Many plants are unsightly, but until the last threat of frost has passed, we are only carefully cleaning up, not removing the damaged parts. That comes later. Magnolias are our one of the true flowering beauties of the garden. However, as so many of us know, these trees can be susceptible to scale, which can ruin the appearance and cut short the life of the tree. After years of trial, I am pleased to report that we have found a product, a natural product, which combats the problem. It’s applied systemically and it works. Call us, 713.869.2797, if you need help with your magnolias. To be certain you receive shades of green, please add us to your address book. If you have a friend who would like to receive this newsletter, please send us their e-mail address. We appreciate comments or questions. Write us at 1137 West 26th Street, Houston, Texas 77008; call 713.869.2797, e-mail us shadesofgreen@mckinnonassociates.com, or visit mckinnonassociates.com.